In the heart of the Grande Île of Strasbourg, in St Thomas’ Lutheran Church, there is a mausoleum, dating from the year 1777, depicting a general, standing tall, surrounded by a wounded lion, leopard and eagle, representing the countries vanquished by his armies. Meanwhile the Grim Reaper waits beside him holding an hourglass while France, personified by a grieving woman, holds his arm. A curious inscription in Latin is inscribed on the obelisk behind him above his statue: ‘Mauritio Saxoni, Kurlandiae et Semigalliae duci, Summo regiorum exercituum praefecto, simper victori, Ludovicus XV, victoriarum auctor et ipse dux, poni iussit.’ This man clearly had a connection with Louis XV, as well as obviously being a victor in battle, but the first title seems a little misleading, not least because his name primarily suggests ties to Saxony; his burial site, a natural connection to France; but the presence of an obscure Duchy at the head of that list seems somewhat conspicuous. The title of Duke of Courland and Semigallia, one of several he held, derives from political intrigue, the demise of a dynasty and the power play between two great empires who both had huge stakes in the westernmost province of modern-day Latvia. It must be stated that the Duchy of Courland and Semigallia was no great prize economically. The Great Northern War (1700-1721), which saw Courland being used as a stomping ground for numerous armies, destroyed much of the local infrastructure, while local populations were decimated by the plague (from 1709-1711). The Kettler dynasty, founders of the semi-autonomous duchy faced a hereditary dead-end. The sickly adolescent Friedrich Wilhelm had died in 1711, shortly after marrying Russian princess Anna Ivanovna, who thereafter ruled as Duchess-Dowager of Courland until 1730, when she became Empress of Russia. However, the sole remaining Kettler, the elderly Ferdinand, was not only childless, but also refused to return to his duchy. This caused a succession crisis, as Polish and Russian forces conspired to control this small but strategically important region. This is where Maurice of Saxony, a German nobleman, soldier of fortune and lothario, as well as the illegitimate son of King Augustus II of Poland (the oldest of 354 acknowledged with this distinction), enters the fray. Having already gained some military experience during the War of the Spanish Succession (in the imperial army of the Holy Roman Empire) and the Great Northern War (in the Russian army), as well as in the Seventh Ottoman-Venetian war (in the imperial army again), Maurice directed his efforts to obtaining the nobility that his illegitimacy had denied him. 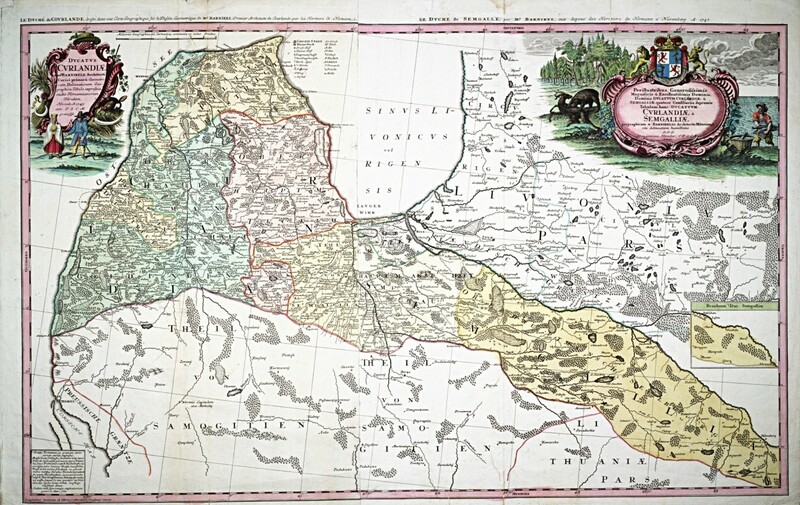 The Landtag of Courland and Semigallia, a parliament of German noblemen based in Mitau (now Jelgava) decided to hold an election on 5th July 1726 to find a successor to the throne. Their election was held based on fears that Courland would lose autonomy within the Polish-Lithuanian Commonwealth if there was no legitimate successor to the Throne. This election was won by Maurice, who had already caught the eye of Duchess Anna Ivanovna and therefore not only had great influence in the Duchy, but contacts with both the ruling houses of Russia and Poland. Despite these connections, however, the Polish Sejm refused to recognise his candidacy. Later that year, in November, the Polish king declared the incorporation of Courland into Poland. Meanwhile, the goodwill that the Duchess initially held for Maurice, based primarily on her romantic interest in him, was completely undercut by his seduction of one of her ladies-in-waiting. Following the discovery of this scandal by the Duchess, Maurice also became a less-than-ideal candidate for the throne in the eyes of the Russian nobility. On 2nd August 1727, the Russian army sent an army of 9,000 men from Riga to force Maurice out and prevent any marriage taking place between him and the Duchess. On 6th August 1727, the erstwhile Duke arrived with an army of 300 mercenaries from the ducal capital, Mitau, to Northern Courland where on 8th August, 1727, he was finally trapped and besieged by the army on an island in Lake Usma, between Talsi and Ventspils. Maurice only managed to escape by the skin of his teeth on 9th August, when – according to some legends, disguised as a butler and being dragged along by a horse – he found his way to Windau. Meanwhile, the Polish sent cavalry and government officials to Mitau to force the Landstag to reverse their vote. With little to his name other than the document confirming his right to the throne of the Duchy of Courland, he sailed back to Danzig, and travelled from there to France to recommence his military career. Nowadays, the legacy of Maurice is long forgotten in Europe. Even in France, his military exploits have long slid into irrelevance. The Battle of Fontenoy, his most famous victory in the War of the Austrian Succession, is merely a footnote in history, even if his military prowess provided him a place in the German pantheon of heroes, the Walhalla monument. His mausoleum in Strasbourg, though glorious in style, seems both overly-extravagant and redundant when considering the changes which have taken place in France since its completion. When the oak leaves start to bud there. Much as Bonnie Prince Charlie maintains a legendary status in Scottish folk history, Maurice has his own peculiar niche in Latvian history. On the first weekend of August every year, Usma holds a village festival called ‘Grafa Morica svētki’, where you can meet Maurice himself (or at least an appropriately dressed doppelganger), and enjoy concerts and sports events. Sadly, this is the closest you can get to Moricsala which is protected territory. The story of Maurice is one of many an exiled aristocrat, kings without kingdoms, betrayed by both their own circumstances and their mistakes. What makes Maurice’s story especially curious is his clear sense of aggrievement over his lost throne. His title (only held by six men in French history) as Marshal General of France clearly meant less to him than his lost title as Duke of Courland and Semigallia, an obscure statelet which was to disappear within decades of his death. It is interesting to imagine how Europe may have changed had Maurice controlled his libido more effectively. His marriage to Anna could well have led to him becoming the Emperor of Russia, a title even more impressive than that which he claimed as Duke. This story also provides insight into a region which was in a state of flux in the aftermath of Sweden’s exclusion from the Baltic littoral following the Great Northern War and the start of the Polish-Lithuanian Commonwealth’s slow, painful decline, as well as the ever-increasing presence of Russian power, both diplomatic and military. Indeed, direct Polish control of the Duchy of Courland and Semigallia was relinquished only a decade after this succession crisis, as a result of the War of the Polish Succession in 1735. After this autonomy was regained, the position of Duke was granted to one of the lovers of Anna Ivanovna’s (then the Empress of Russia), and Courland, despite nominal Polish control, became a de facto political satellite of Russia. By the end of the century, the Duchy had become part of Russia proper. Geoff Chester is a history buff and a proud resident of Liepāja. © Deep Baltic 2018. All rights reserved.